For thousands of years, voyagers of inner space--spiritual seekers, shamans, and psychoactive drug users--have returned from their inner imaginal travels reporting encounters with alien intelligences. 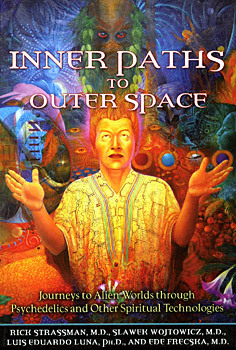 Inner Paths to Outer Space presents an innovative examination of how we can reach these other dimensions of existence and contact otherworldly beings. Based on their more than 60 combined years of research into the function of the brain, the authors reveal how psychoactive substances such as DMT allow the brain to bypass our five basic senses to unlock a multidimensional realm of existence where otherworldly communication occurs. They contend that our centuries-old search for alien life-forms has been misdirected and that the alien worlds reflected in visionary science fiction actually mirror the inner space world of our minds. The authors show that these â€œalienâ€� worlds encountered through altered states of human awareness, either through the use of psychedelics or other methods, possess a sense of reality as great as, or greater than, those of the ordinary awareness perceived by our five senses. "Those who regularly navigate the hyperspatial landscape that some have called the â€˜tryptamine dimensionâ€™ have long suspected that the portals to inner and outer space may be one and the same. This book, a collaboration of the most cutting-edge shaman/neuroscientists working in this field, boldly explores this concept in a stunning tour de force." "The profoundest inquiries into the nature of reality and the mystery of consciousness are made possible by the psychedelics and other spiritual technologies explored in this astonishing, groundbreaking, and utterly revolutionary book. Written by the maestros of the field, it is exactly the right book at exactly the right time. I found it gripping, thought-provoking, incredibly informative, and--on top of all that--a hugely enjoyable read." Slawek Wojtowicz is a medical oncologist working in the pharmaceutical industry in Edison, New Jersey, a science-fiction illustrator and the author of Daydreaming. Luis Eduardo Luna is coauthor (with Pablo Amaringo) of Ayahuasca Visions and director of Wasiwaska--Research Centre for the Study of Psychointegrator Plants, Visionary Arts and Consciousness in Florianopolis, Brazil. Ede Frecska is chief of psychiatry at the National Institute of Psychiatry and Neurology in Budapest, Hungary, and a contributing author to Psychedelic Medicine.